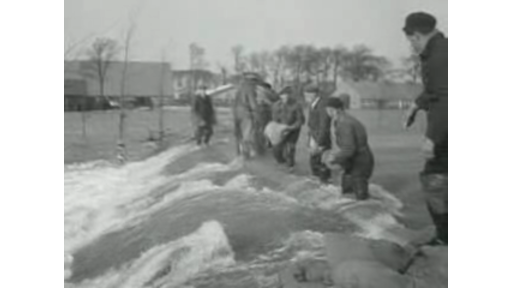 It is 66 years ago to the day that the Netherlands was hit by a big natural disaster, the North Sea flood (“Watersnoodramp”). In the early morning of 1st February 1953, the dykes broke through due to a heavy storm and high tide and water flooded large parts of the South-West provinces. Over 1800 people died and many were forced to leave their houses and seek refuge elsewhere. This blog highlights several videos in relation to the disaster, the migration of people, aid actions and the reconstruction. The Dutch have a centuries-long tumultuous relationship with water. Twenty per cent of the country is below sea level and fifty per cent is less than one meter above it. Floods have been depicted in images for hundreds of years, for instance in this lithography, by Jan Kuypers, which shows relief actions and shelter provided to the victims after a flood in 1876. In total 72.000 people were evacuated for a longer period of time. The majority of people eventually returned to their homes, but large groups migrated to other places in the Netherlands to start new lives. Especially farmers were hit hard as their land had become infertile after the flood. At least 34 Zealand farmers had to start over in the Noordoostpolder, an area in the Flevoland province. This video shows the farmers officially giving up their land and singing a lease for their new farms. Netherlands Institute for Sound and Vision, CC BY-NC-SA. The Dutch tried to help their fellow countryman by donating to the National Relief Fund. There were also international actions, like the one held by Dutch illustrator Eppo Doeve. People were encouraged to buy a ‘Doeve-postcard’ for 10 cents with the Latin text “Luctor Et Emergo” (I struggle and emerge), which is the motto of the Zealand province. The card shows an image of the disaster and includes a text in Spanish, English, French and German on the back to thank people and reassure businesses relations about the resilience of the Dutch industry. Over 100.000 postcards were sent. Eppo Doeve, International postcard National Relief Fund, Collection: Netherlands Institute for Sound and Vision. In addition, a local action called ‘operatie snert’ (operation pea soup) was organised. 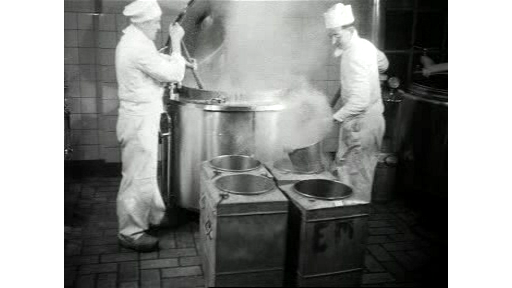 Soldiers of the Prince Hendrik Barracks in Nijmegen made 30.000 litres of pea soup and sold it in the streets and at people’s houses. In this video, the director of the National Relief Fund sells the first bowls of soup. The contributions added tens of thousands of Dutch guilders to the fund. A disaster of this magnitude should not happen again and therefore the government accepted the ambitious Delta Plan in 1957, one of the most revolutionary hydraulic engineering projects in the world, as shown in the video ‘Six years after the storm tide’. One of the most important tasks was to shorten the coastline by 700 kilometers, the motto being “The shorter the coast, the easier the defence’.3 To this day, the Dutch continue to defend their country from the water, anticipating short and long term solutions with the Delta Programme. With current climate change and the rise of the sea level, this is a matter of urgency, not just on a national but also a global level. Six years after the storm tide (in Dutch), Netherlands Institute for Sound and Vision, CC BY-SA. 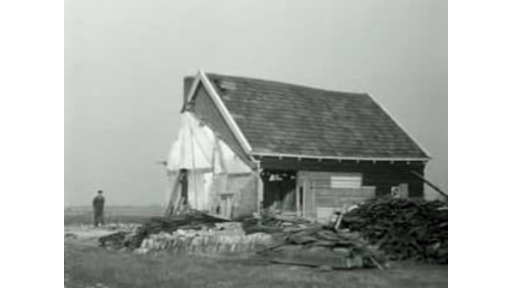 Frame from the video Six years after the storm tide, Netherlands Institute for Sound and Vision, CC BY-SA.